"I'm not crying, I've been chopping onions!" Christmas doesn't officially start until the film version of The Snowman, Raymond Briggs' wonderful tale of the loss of childhood innocence, has been shown on the television to dabbed eyes, or at the very least awkwardly cleared throats. It is, let's be honest, the ultimate bummer and something only us British could think of to welcome in a season that's otherwise considered one of goodwill, cheer, and celebration. Intriguingly (and, we have to confess, a little worryingly) there's a sequel to the classic film coming out this Christmas, titled The Snowman and The Snowdog. While this free mobile game might be nothing more than a promotional tool for the upcoming Christmas Eve debut of the film, my goodness what a promotional tool it is. 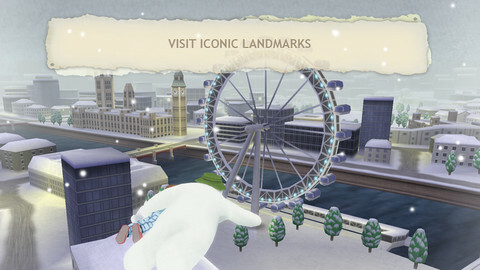 It's an on-rails game that sends the young boy, his Snowman, and the newly introduced Snowdog on a swooping, aerial journey through some very familiar landscapes. Snowflakes are everywhere, and tapping on them increases the time you have to continue with the game. You're never really in danger of running out of time, but it's a nice way of keeping your attention focused on the gorgeous vistas, and making sure you keep your eyes peeled for collectible objects. As you encounter different areas of the game's half-dozen or so stages, you'll unlock new mini collection missions. Veer close to a huge pine tree and you'll have the chance to swirl endlessly around it until you've gathered every last parcel for example. 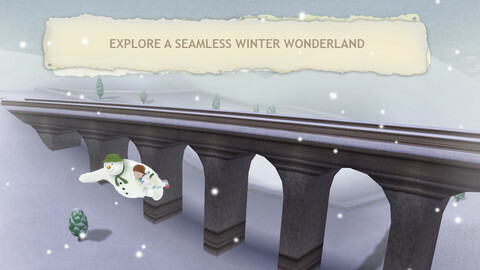 In other areas you'll need to collect a number of miniature snowmen, or fairies by making light taps of the screen. Movement around the swooping landscapes is largely out of your control, although you can slow your trio down with a little downward flick of the screen if you want to grab some more goodies before moving on. Delightfully, and something we only discovered late in our review, a sideways flick will cause them to gently barrel-roll in the air. There's no actual reason to do this, it's just one more feature of the game that's apparently designed to increase the possibility that you might actually cry in the office. The game does an absolutely majestic job of paying tribute to every key scene from the original film, each of which has long become engrained in our collective consciousness. There's the journey through the rolling fields of rural England, the familiar sights of London, the last train before Christmas that races through the countryside and, of course, the North Pole. You might feel that a Snowman game without the chilling choral soundtrack of Walking in the Air is no Snowman game at all, but you'd be wrong. In its place is an equally sad yet jaunty tune that drips with festive cheer thanks to a dense but delicate orchestral arrangement. If this is the lead soundtrack chosen for the film's sequel, then someone at Channel 4 deserves a pay-rise this Christmas. We've been fairly gushing in our appraisal of The Snowman and the Snowdog so far, and that's because it's injected us with a bit of genuine Christmas magic as we inch closer to the festive season. On the downside, it's a simplistic game that won't necessarily challenge or provide long-term entertainment and so is more of an interactive movie than a game. Does that matter? Maybe it does, maybe it doesn't. Regardless, you should still make this enchanting mobile experience a part of your Christmas this year. 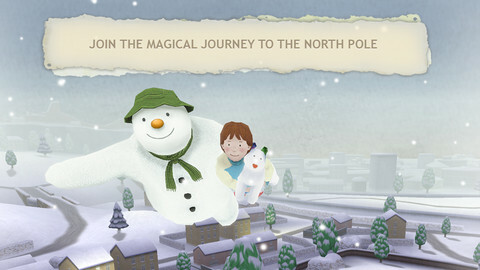 The Snowman and the Snowdog is not currently available in the US App Store. We'll add a link to this article if it becomes available. What's Hot: A magical, wonderful game that will have you blubbing long before Christmas Eve.